Knitting brings hope to Rwandan war widows. Ergonomist Carson Demers has your back (and wrists and hands). Meg Swansen sings the praises of her favorite sweaters to knit. Karin Strom tours mountainous Kyrgyzstan, with its dramatic scenery and abundance of cashmere goats. 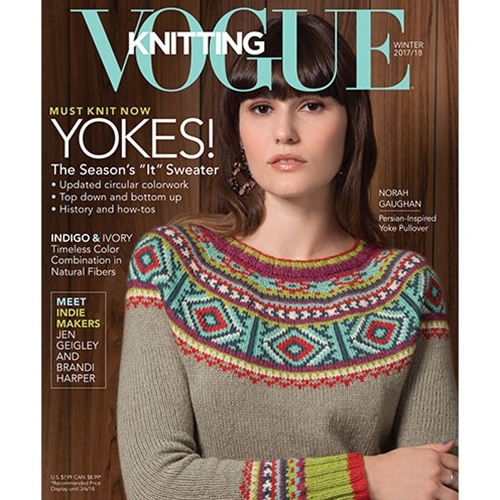 The classic yoke sweater is enjoying a spotlight moment. Reminiscent of mosaic tiles, Maie Landra’s wrap is a modern masterpiece. JEN GEIGLEY’s bold minimalism captures the spirit of a crafting movement; BRANDI HARPER on what it takes to be successful in a creative industry. Cream and blue harmonize to perfection.